Within this book, an entertaining and creative tale awaits you! It was so entertaining for me, I read it twice! 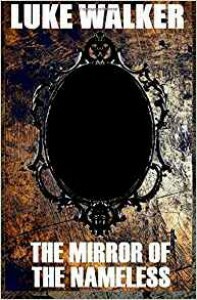 In THE MIRROR OF THE NAMELESS, Luke Walker has created a world where the Gods have returned-but not the God of Catholicism or even Buddha. These are Gods unlike anything you have seen before. For instance: Naz Yaah, the giant white worm that leaves noxious trails of slime in its wake. Or perhaps the giant zombie, Segoth? It sheds burning, acidic pieces of itself willy-nilly, while sucking people into itself at the same time. Lastly, there is Gatur: spreader of the green mist which causes people to hurt the ones they love. And when the mist disperses? Most are so horrified by what they've done they kill themselves. All of these creatures appear and disappear at will. Humanity is supposed to be happy about them and view their deaths as a necessary sacrifice. To speak out against them in any way is considered blasphemous and likely to be punished by death. In this midst of this monstrous world, Dave is trying to get to his daughter, Ashley. His potential son-in-law Tom warns Dave that his daughter is getting herself into trouble. She is doing illegal research regarding these Gods because she believes that they may not belong to this world, or that perhaps humans can escape to another world? All of this via the use of a special mirror which she sets out to locate. Dave and Tom head off cross country to find her, all the while trying to avoid the various Gods as they pop up , as well as the cults and crazies who dedicate their lives to these creatures. Will Dave, Tom and Ashley survive this crazy world? You'll have to read this to find out! I first read THE MIRROR OF THE NAMELESS when it was originally released at the beginning of 2014. I know I enjoyed it back then because I wrote a review. Unfortunately, that publisher has since closed, leaving the book out of print. Luckily, Kensington Gore recognized the excellence of this novella and brought it back. Even though I've read it before, I only had a vague memory of it, (I've read hundreds of books since then), so I was excited to check it out again this time around. Yesterday afternoon when I finished, I rated this 4.5/5 stars, but after thinking about it overnight, I decided to give it ALL THE STARS, because I cannot think of one thing that could have been done better. THE MIRROR OF THE NAMELESS is a compelling, creative read and you won't find anything else out there quite like it. For that reason, I give it my highest recommendation!